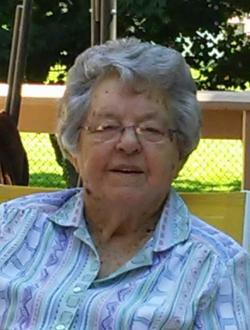 The death occurred, surrounded by her family, in O'Leary on Sunday, May 13, 2018 of Edith Louise Palmer aged 96, wife of the late Alvin Palmer. Edith was born in Brooklyn on August 30, 1921, daughter of the late Frederick and Alice Maude (Johnston) Wells. Cherished mother to Rev. Elaine Palmer-Harding, Summerside; Cheryl (Roger) LeBlanc, Riverview, NB and Carol, whom Edith lived with in O'Leary . Loving grandmother to Rick (Marina) LeBlanc, Moncton and Tracy LeBlanc, Riverview. Great grandmother to Sasha LeBlanc and Mackenzie Bradley. Dear sister to Isabel Hardy, Montrose. Edith is predeceased by her parents, husband Alvin (2001), great grandson Jack Bradley, brothers Arthur, Walter, Johnston and sister Martha Smallman. Resting at the Ferguson Funeral Home and Chapel, O'Leary with visiting hours on Wednesday from 6:30 - 8 pm. Funeral service at the O’Leary United Church with Rev. Robert Lockhart officiating on Thursday at 2 pm. Private family interment later in the Bloomfield United Cemetery, Woodstock. In lieu of flowers, in memory of Edith, memorials to O’Leary United Church would be appreciated. Due to family allergies, please refrain from wearing scents and ordering flowers with lillies.